Did you ever wonder where the magic RRIF minimum withdrawal percentages came from? I may have figured it out by accident. I was creating a chart to show that these minimum withdrawals will deplete RRIFs over time and that yearly payments would very likely decrease over time. Then I came across an amazing coincidence. I set out to find out how RRIF payments would change over time if the investments make a steady real return. “Real return” means the return above inflation. So, if the return is inflation+3% every year, what will your inflation-adjusted RRIF minimum withdrawals look like? I calculated this for real returns from 0% to 6%. The following chart shows the results. Keep in mind that the incomes are inflation adjusted. So, the chart shows how your purchasing power changes over time. The first thing that jumped out at me was the 6% real return line. In this case, your minimum withdrawals almost exactly keep up with inflation from age 72 to 94 (and then fall like a stone). This can’t be a coincidence. It must have been a design goal for the percentages. Essentially, the RRIF minimum withdrawals are designed for a steady return of 6% over inflation. Unfortunately, averaging such a high return over many years is not very likely. It could happen for an all-stock portfolio with no investment fees, but even then you shouldn’t count on it. For investors with a more balanced portfolio and who pay fees, inflation+2% is much more realistic. Unfortunately, if you look at the line on the chart for a 2% real return, the results don’t look too good; your purchasing power falls quickly and is cut in half in about 16 years. It’s not too hard to see why retirees probably shouldn’t spend all of their RRIF minimum withdrawals in their early retirement years. 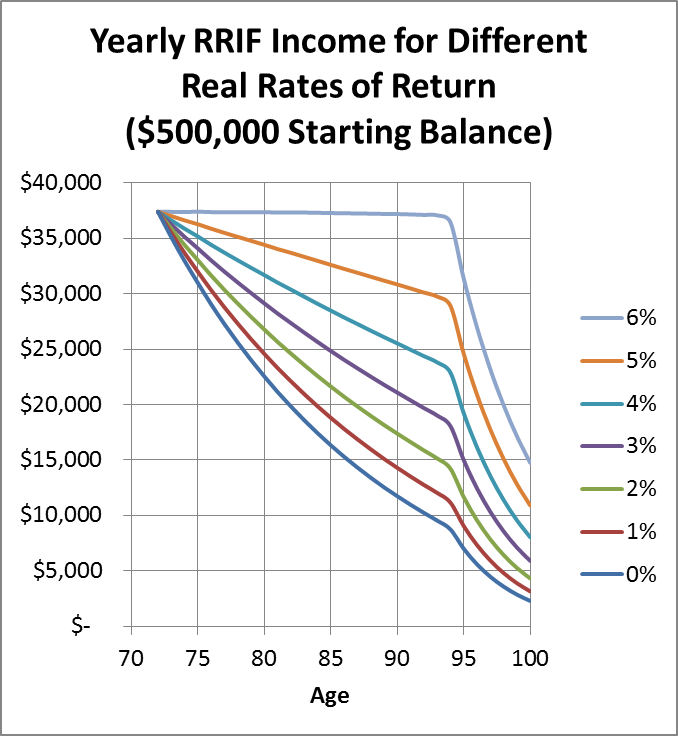 It’s prudent to save some money for later years as their RRIF income falls. This is why, in some cases, it can be more effective to have monies in non-registered investment accounts. If you receive dividends from the non -registered account they will be taxed at a reduced rate than monies received from a RIIF or annuity which get taxed at your full tax bracket. Many scenarios on where to squirrel that hard earned cash away. This becomes more evident later in life once the kids have flown the coup and you have little or no debt. Where do you save your money if you already max out the RRSP and TFSA? Again, this is a problem many people will not have. If you do have that problem then you can still consider yourself lucky to have it rather than having to wonder if you have enough money to retire. Just in case you are wondering, you never have enough. Or at least so we think. That is human nature. We always want more for that security blanket. I'm happy to have the problem of having used up all my RRSP and TFSA room. I'm working hard on being happy with what I have instead of comparing myself to people who have more. In the vast majority of cases it is better to max out the RRSP & TFSA. But in some situations where your RRSP balance has exceeded lets say the $1 million you would probably be hit with an OAS claw back. Agreed that this is not most peoples situation but never the less it might be better in that situation to slow down the RRSP contribution so that your withdrawlas do not exceeded the OAS claw back limit once you start to pull the money out. If you do exceed the limit you not only pay the full tax rate on the withdrawal but also lose on the OAS. A double whammy. At any rate most people will not see this situation, just those who have done well saving as well as grown their principal within the RRSP. Good catch, Michael. A constant 6% real return and a mortality target of 95, it's incredibly stupid of our government to leave that unchanged! @Anonymous: I agree that averaging a 6% real return is too high for people to count on, but keep in mind that the RRIF minimum withdrawal is about the government getting their tax money; it doesn't have to be the amount you choose to spend. I wonder if there's an unexplored benefits of these forced withdrawals that can easily exceed spending needs. We all want to minimize taxes paid. Anything in the RRSP that is left to the estate will generally not be taxed lightly, especially if it is a large account. By spreading out the withdrawals over several years as the rule forces you to do the resulting taxes may be lower. I guess this is only a concern for the minority who have no fear of running out of money in their lifetime. @Richard: Whether or not the forced withdrawals help with the total tax burden would vary from case to case, but, in general, deferring taxes is better so that you get capital appreciation on a larger asset base over the years. Great detective work. Do you know when the RRIF rules were devised? I suspect interest rates were about 6% at the time and the etiology was for flat nominal income on that return... But I haven't looked closely enough to see if that would work with your calculations. @Potato: I haven't checked when the RRIF rules were first devised. The math works out the same if you assume a nominal 6% return and ignore the effect of inflation on withdrawals. So, you could be right that the original percentages were created based on an assumed 6% return. A 6% growth may not be possible but the 95 years date sounds nice to me, whether I get there, I'll keep you posted. Are you planning on keeping enough beer around until then? Can you please clarify something for me? You say "So, if the real return is inflation+3% every year..." but isn't this the nominal return with the real return being 3%? @Anonymous: A bad edit left the redundancy. I've fixed it now.